Specialty: Developed some of the worlds fastest Supercomputers for scientific research during the 1970s through 90s. 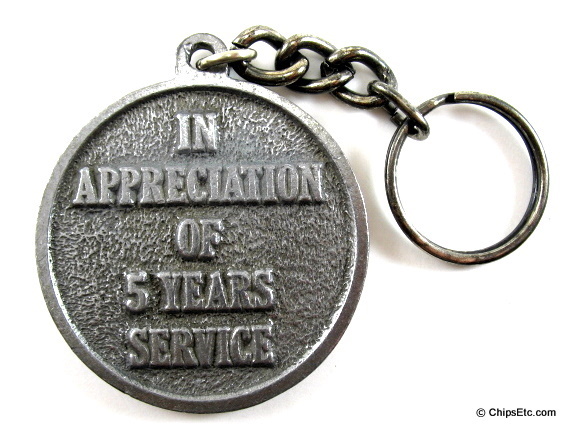 Solid Pewter medallion given to a Cray Employee to award 5 years of service with the Company. 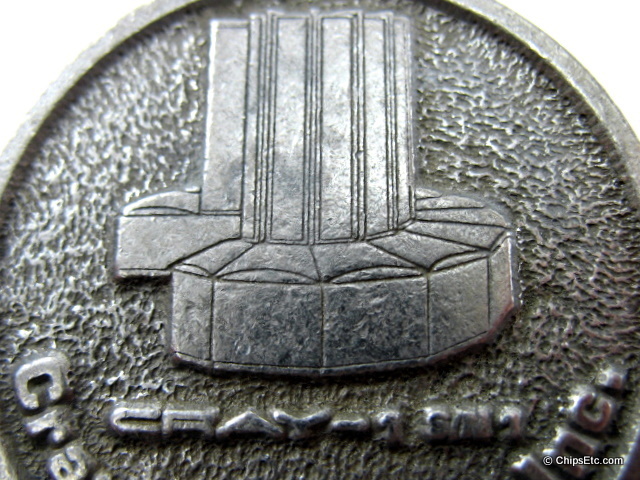 Medallion features an image of the Cray-1 Serial #1 Supercomputer that was shipped to the Los Alamos National Laboratory in 1976 for a six-month trial period. 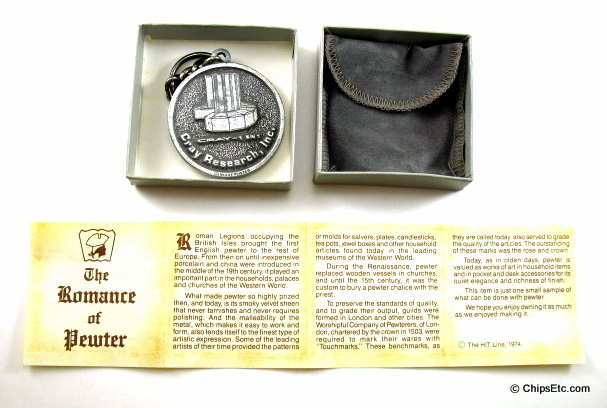 Comes new in original gift box with pamphlet about History of Pewter . 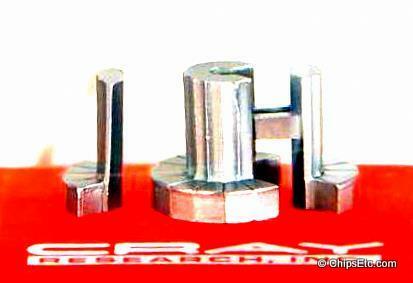 Made by HIT promotional products. 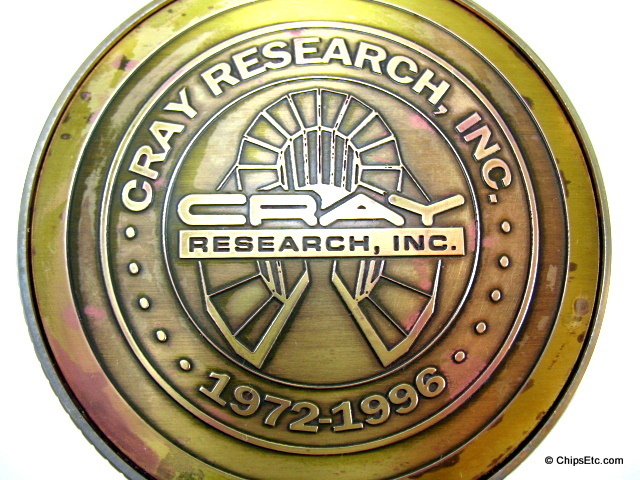 Has "CRAY Research, Inc." & CRAY-1 S/N 1" on the medallion front, back of medallion reads "For 5 years of Service". 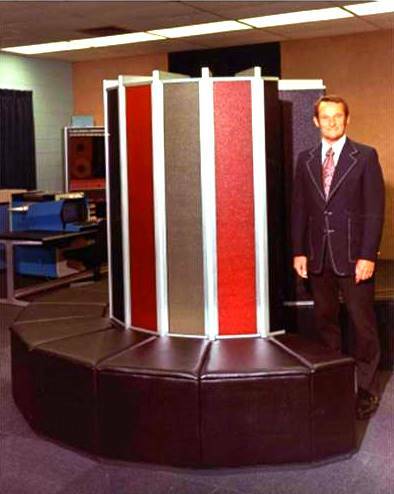 The Cray-1 Super Computer operated at 80Mhz using Integrated Circuit chips from Fairchild Semiconductor and Motorola that were mounted on a variety of Printed Circuit Boards. Some of the boards contained as many as 144 chips per board. More than eighty Cray-1's were eventually sold, priced from $5M to $8M each. 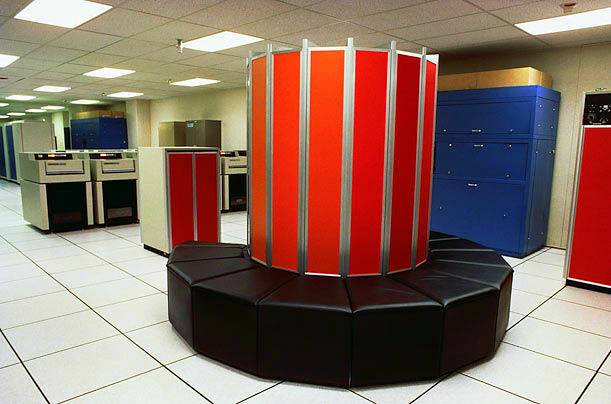 The Cray model X-MP was a supercomputer that was designed, built and sold by Cray Research. 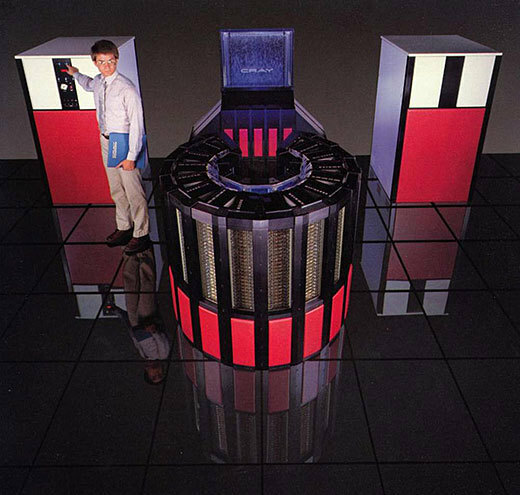 It was announced in 1982 as the successor to the 1975 Cray-1. 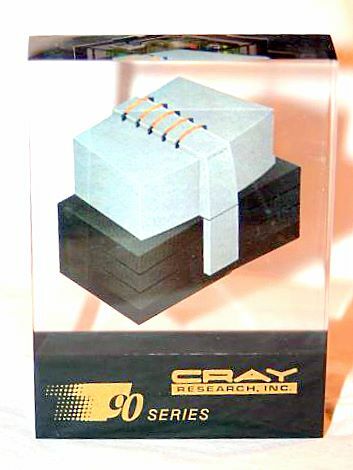 Improvements over the Cray-1 allowed the Cray X-MP to become the fastest computer on the planet from 1983 to 1985. The principal designer of the X-MP was Steve Chen. 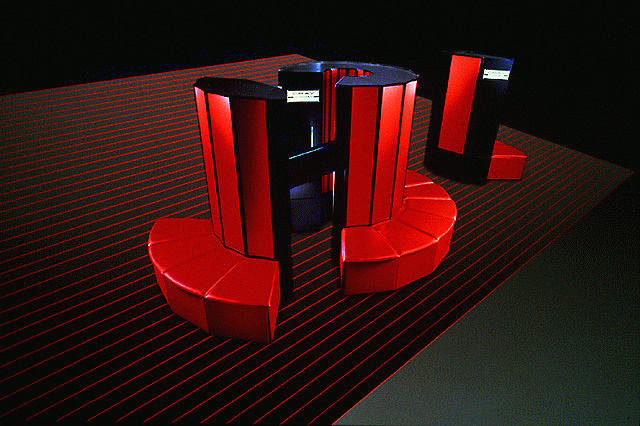 The X-MP's main improvement over the Cray-1 was that it was a shared-memory parallel vector processor, the first such computer from Cray Research. 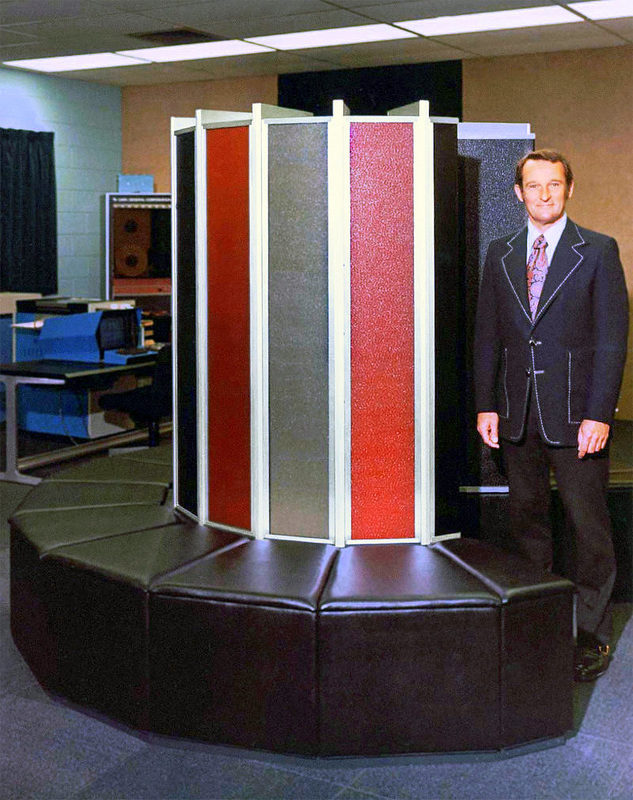 It shared the classic "C" or "Horseshoe" design of the earlier Cray-1 machine and looked almost identical on the outside. 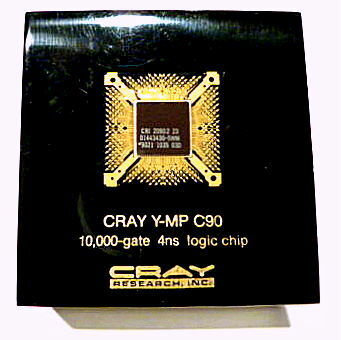 The Cray X-MP's processors initially ran at 9.5 nanosecond (105 MHz) clock cycle (compared to 12.5 nanosecond for the previous Cray-1A model), delivering a theoretical peak speed of 200 mega-flops per processor and 400 mega-flops for the original two processor 1982 model. 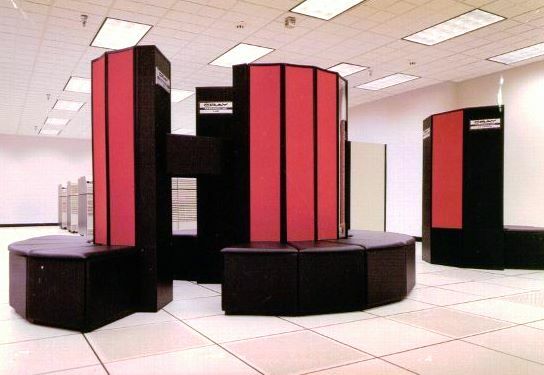 The Cray-2 was a vector supercomputer made by Cray Research. 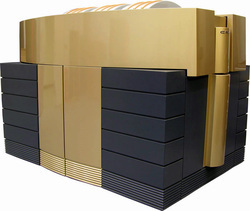 When it was introduced in 1985 it replaced the Cray X-MP as the fastest computer in the world. 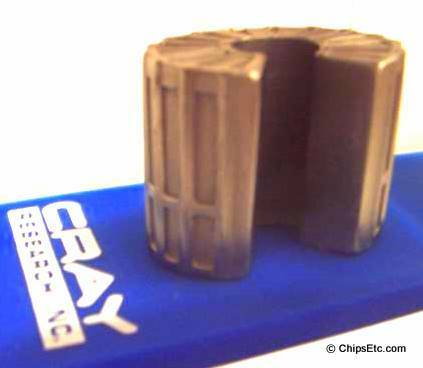 The Cray-2 was capable of 1.9 gigaflops peak performance. It was not until 1990 that another Supercomputer (The ETA System's liquid-cooled Model ETA-10G) would steal it's crown as the worlds fastest computer. 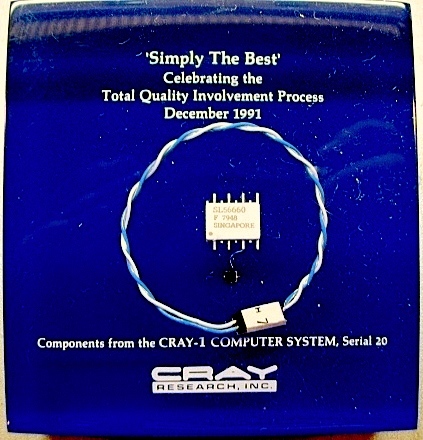 The Cray-2 was predominantly developed for the United States Departments of Defense and Energy. Uses tended to be for nuclear weapons research or oceanographic/Sonar development. 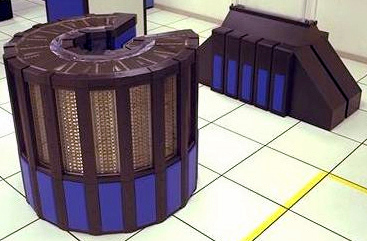 Some Cray-2 computers were delivered to civil agencies (such as Nasa Ames Research Center), universities, and corporations worldwide. 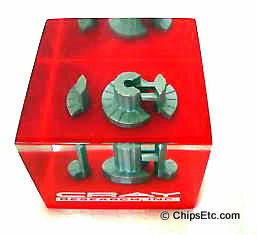 In the center of the cube is a three dimensional pewter model of the CRAY-2 Supercomputer. 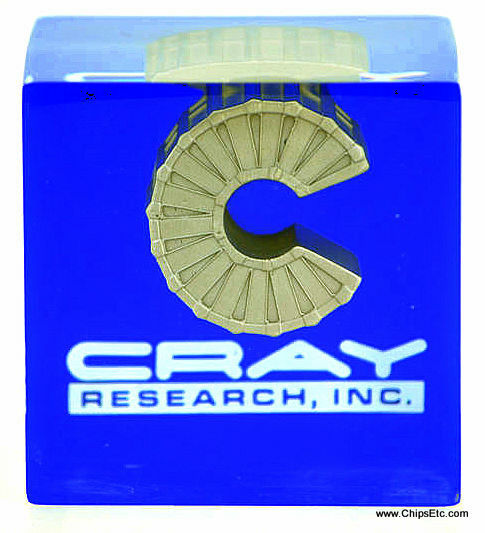 The base is blue with the words “Cray Research, Inc.” printed in white letters. Measures 2" x 2" x 2". 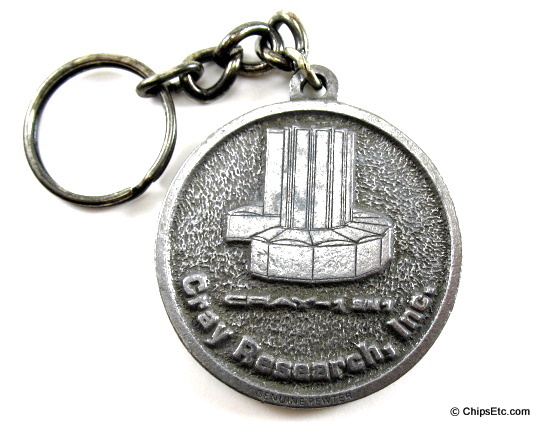 This is a bronze keychain that has the Cray Research Inc. logo. 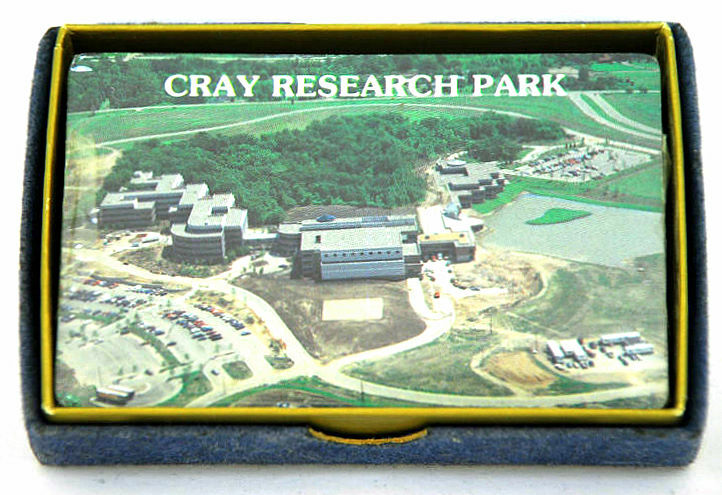 This is a set of playing cards showing an aerial view of the Cray Research Park which was located in Eagan Minnesota, a suburb of Minneapolis. The former 480,000-square-foot campus & headquarters of Cray Research was sold in 2002. 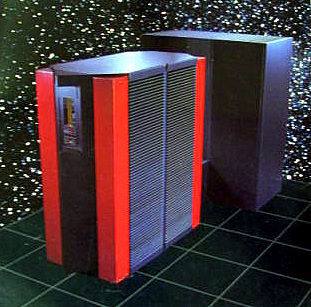 The Cray Y-MP was a vector supercomputer made by Cray Research, introduced in 1988. 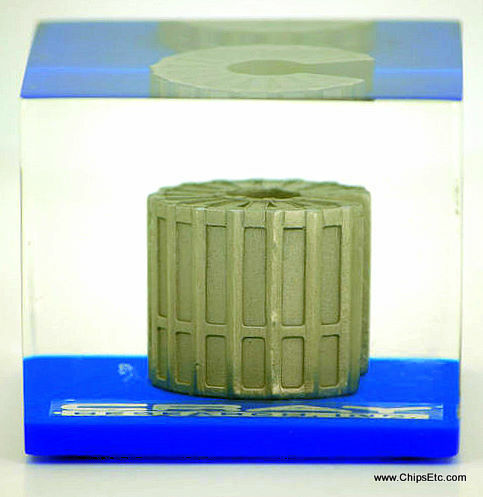 In the center of the cube is a three dimensional pewter model of the CRAY Y-MP Supercomputer. 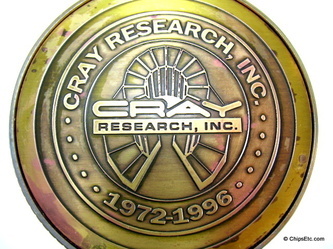 The base is black with the words “Cray Research, Inc.” printed in white letters. Measures 2" x 2" x 2". 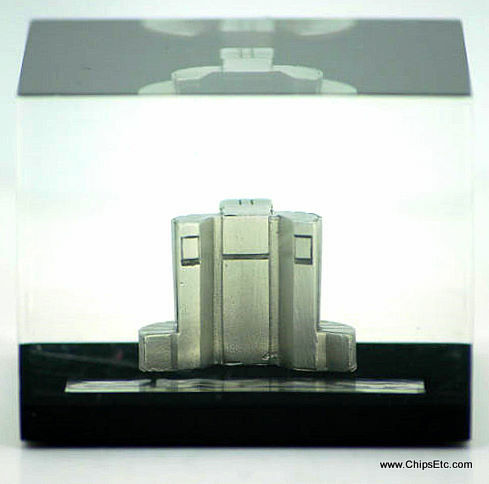 This is a Cray Research paperweight featuring a real Cray Y-MP 11,000 gate 4ns computer logic chip. 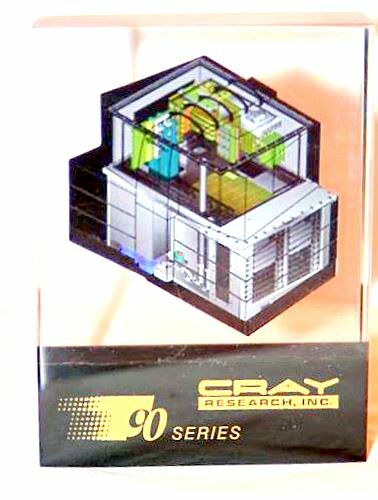 Cray Research paperweight from 1991 featuring components from a Cray 1 Computer system, serial #20. Reads "Simply the Best, Celebrating the Total Quality involvement Process". 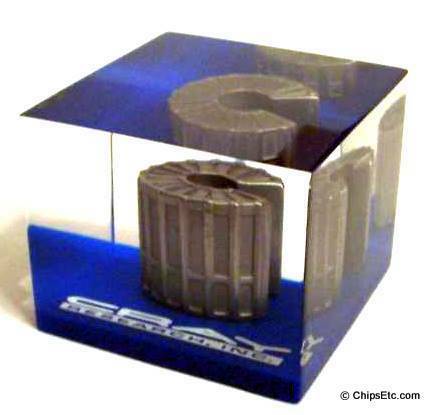 Clear Lucite paperweight with blue background measures 3" x 3". 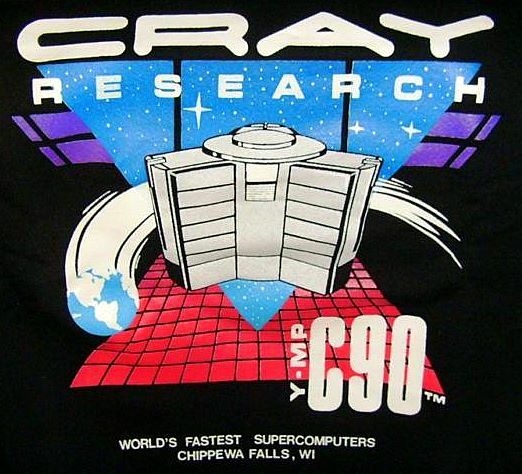 The Cray T90 series was the last of a line of vector processing supercomputers manufactured by Cray Research, Inc, superseding the Cray C90 series and followed the Cray X-1. The first machines were shipped in 1995, and featured a 2.2 ns (450 MHz) clock cycle and two-wide vector pipes, for a peak speed of 1.8 gig-flops per processor; the high clock speed arises from the CPUs being built using ECL logic. 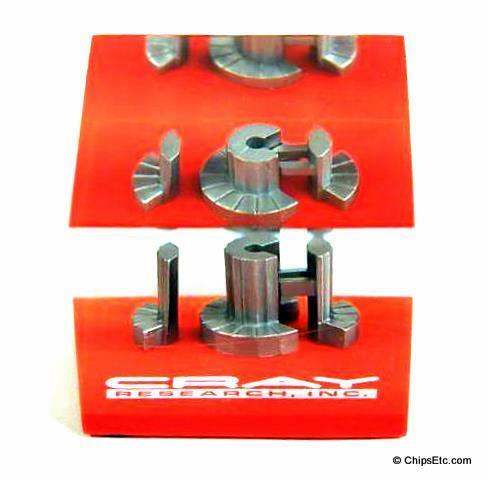 As with the Cray J90, each CPU contained a scalar data cache, in addition to the instruction buffering/caching which has always been in Cray architectures. Configurations were available with between four and 32 processors, and with either IEEE 754 or traditional Cray floating point arithmetic; the processors shared an SRAM main memory of up to eight gigabytes, with a bandwidth of three 64-bit words per cycle per CPU (giving a 32-CPU STREAM bandwidth of 360 gigabytes per second). The clock signal is distributed via a fiber optic harness to the processors. The T90 series was available in three variants, the T94 (one to four processors), T916 (eight or 16 processors) and T932 (16 or 32 processors). Clear Lucite paperweight with black base and gold lettering. Measures 4 inches high x 3 inches wide, 1" thick. 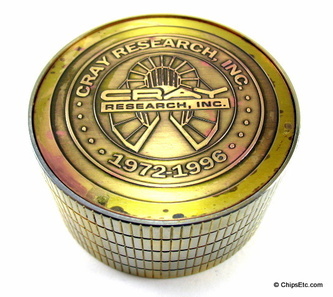 Cray Research, Inc. (CRI), was founded in 1972 by computer designer Seymour Cray. 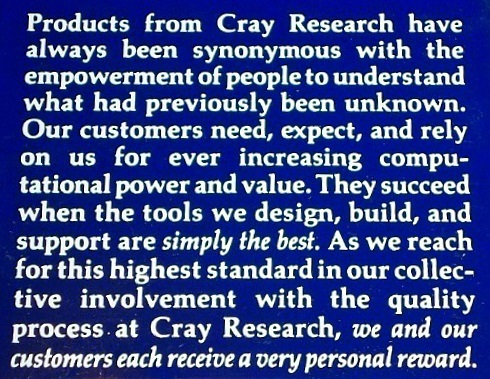 Seymour Cray went on to form the spin-off Cray Computer Corporation (CCC), in 1989, which went bankrupt in 1995, while Cray Research was bought by Silicon Graphics, Inc. (SGI) the following year in 1996. 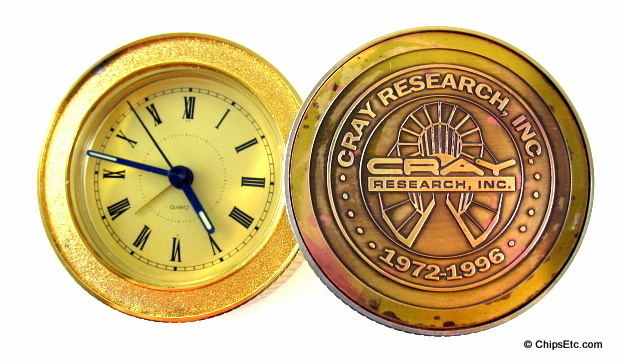 This is a Cray Research, Inc. brass clock that was only given to Cray employees in 1996 to commemorate the end of the company's era from 1972-1996. 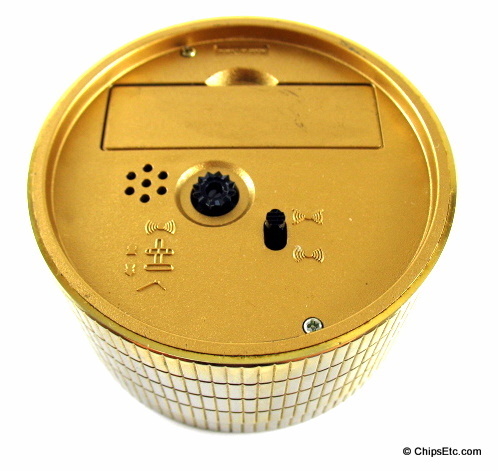 The clock's top cover features an image of the Cray-1A Supercomputer and "1972 - 1996". 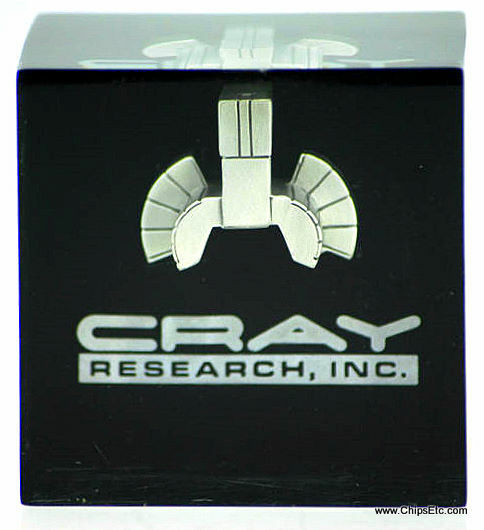 This collectible pen from the 1980's is from Cray Research, Inc. A pioneer in super computing. This item came from the estate of former 15 year Cray Research employee. "It seems every time we had a meeting we would get a Cray T-shirt and a pen." Pen has refillable cartridge. 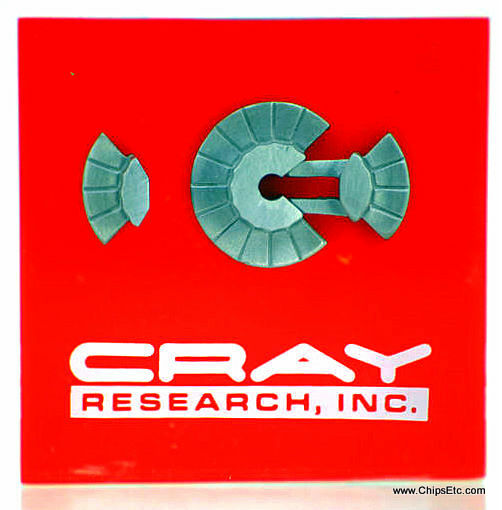 It is robin's egg blue and has "CRAY RESEARCH, INC. - THE SUPER COMPUTER PEOPLE" on the shaft.